“This is a curatorial class—it’s a great atmosphere to experiment,” Tom Franco told the 20 students gathered at their first meeting in the Sesnon Gallery at UC Santa Cruz. The 34-year-old Berkeley artist was on campus to help co-teach a 10-week class called Curatorial Practice with gallery director Shelby Graham. A UC Santa Cruz alum (he graduated with a B.A. in Fine Art-Sculpture in 2002), Franco is also the founder and director of the Firehouse Art Collective, a pioneering nonprofit that is changing the arts community in the East Bay. Established in 2005, the collective currently has four spaces in Berkeley, and one in Oakland. “One space is residential, the living room is the gallery,” Franco noted. Collaboration is the key to Franco’s life—working together with other artists and helping to create environments to make art happen. “My family’s very artistic,” said Franco, whose parents both were painting majors at Stanford. In his teens, he took art classes after school at night in Palo Alto with his brother James, who went on to become a famous actor. “There’s a lot of pressure to perform and do something, because he’s so successful,” Franco noted. 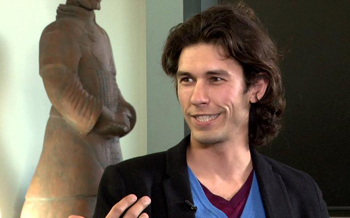 His work as a sculptor and painter eventually became the foundation for the “Tom Franco Co-Lab”—a project focused entirely on works created in tandem with one or more artists. Franco was able to reconnect with UC Santa Cruz a little over a year ago, when campus alumni held an open mic event at one of his collective’s spaces in the Bay Area. He said the Santa Cruz campus—and the facilities—gave him ample time to explore his interest in art. “I loved how the smaller colleges at UC Santa Cruz made it a tighter community so you could have close friendships,” he recalled. “I did some painting, sculpture, and worked in the metal welding shop. It’s metal welding that was my love. The experience of having a full shop with all of the equipment was great. I haven’t had a shop experience like that since,” he added. After hosting the alumni event, he agreed to do a mini-version of the collaborative Firehouse Collective at the university. 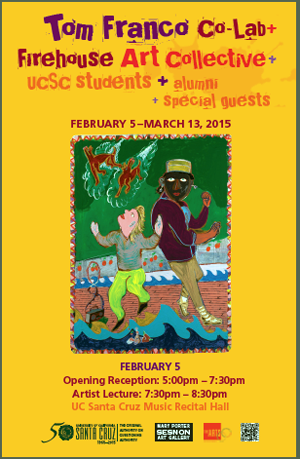 As a result, he’s bringing a number of other artists with him to campus this quarter, many of them also UCSC alums. They will work with students and help present an array of events--ranging from film screenings to concerts featuring live painters and videographers. Franco will also give a free public lecture on Feb. 5 at UC Santa Cruz’s Music Center Recital Hall titled “The Artist Community Collaborative Experience.” His talk kicks off the opening of the Tom Franco Co-Lab exhibition at the Sesnon Gallery, which will run until March 13.